Morning all! Today, we’re pleased to announce the upcoming release of LittleBigPlanet – Game of the Year edition, which will ship to stores on September 8th for $59.99 with a “Sackful” of bonus content. 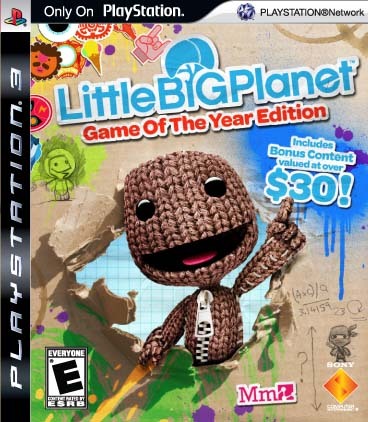 First off, you’ll get the full award-winning LittleBigPlanet gameplay experience, or as we like to call it “Play Create Share” – ok, that was a bit to ‘infomercially’ (sorry), but you get the idea. Everything that made LittleBigPlanet one of the biggest games on the PS3 is in there. Next, to give our new fans a taste of the over 1,000,000 user-generated levels available on the PlayStation Network, Media Molecule has hand-picked 18 extraordinary people to Create bonus levels specifically for the GOTY edition – complete with interviews with each creator. We loved how these levels turned out and hope you will to. 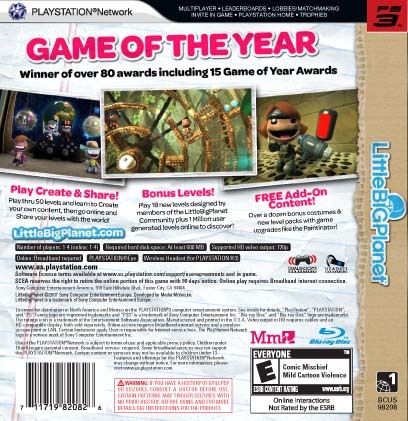 Finally, as a peek at the next game in the “Play, Create, Share” family, a limited supply of LittleBigPlanet – Game of the Year Editions will include a special voucher code for the upcoming ModNation Racers Online Beta. This is your chance to play ModNation Racers before the game comes out in 2010. If you haven’t checked out ModNation yet, and you’re a big-time racing fan, always dreamed of creating your own track, or you’re into vinyl art – head on over to www.ModNation.com and register. All together, with bonus content valued at over $30, the award-winning experience and over 1,000,000 levels to play online, it’s a great offer for those that haven’t joined the LittleBigPlanet community yet…all bundled in one neat little ‘sack’. Amazing game, so much value in it and it’s great you’re providing even more. Now when’s this going to go Greatest Hits for even more people to make levels! i would buy this just to get the beta, those 18 extra levels, and the dlc, cause i only have the MGS pack out of all the DLC the GOTY edition comes with. speaking of the ModNation beta, how will others get it if they already have LBP? As of right now, this is the only way in, but depending on a number of factors, this may change. It\’s probably best to register on the ModNation website to be the first to hear of any news. Must…fight….urge to spend…..60$ on mod….beta….damn you win sony, I will buy this and give my original copy to my gf’s brother. I think this edition will help the game to sell more copies. I really hope this game reaches 4Millions unit sold. ALSO I WANT NEW LEVEL PACKS JUST LIKE THE MGS4 PACK PLEASE!!!!! Nice….another slap in the face of those of us who bought the game on day one. Oh, well, maybe I’ll get a beta invite from Qore. Hey mark, for people who already own the game, will they be able to get the 18 levels and commentary in a dlc pack? hey Sony, now that I have checked the ModNation Racers page I think that those characters can be used like “PSN AVATARS”. What I mean is that maybe you could change in some aspects the characters of HOME to a more charismatic portray of yourself. I am not saying that you must replace them; just saying that some changes are needed. Interesting idea, I\’m sure the ModNation team has this on a wish list somewhere. I\’ll check in with them. Nice but.. Was this the big august 18th announcement? just wondering. But still, 18 extra levels and acsess to the Modnation racers beta? nice deal. Don\’t worry…wait until tomorrow for \”bigger\” announcement. will our non game of the year edition saves work with this version? it would be awesome if they did! @ 7, hows this a slap in the face? This came out a year ago. I notice that the back of the case says PlayStation Home support. Any comments? I’d buy it if I already didn’t own it. @21 i noticed ps home support also.. hopefully its stuff you get ingame for owning/playing the game.. that would be sweet! I love LBP, its the one game that after many months or release I always keep coming back for more, and every time I come back for more, there are better and better user created levels to play on. Its a true testament of the potential this game posses. Will there be any way for people who already own the game to get the 18 new levels? I would love to get those levels as DLC. is there any other way I can get into the modnation racers beta? I really want to get into it, but I dont want to buy a game I already have =P. LittleBigPlanet Should have a HOME space. Jeez im crying tears of happiness. I love LBP (bought all DLC) and i play it every night around 20 minutes to 2 hours (usually around an 1 hour) and ill be buying this edition with no regrets. And modnation racers is my most anticapated game which makes the deal even sweeter. How limited is the supply for Modnation Racers online beta? doesnt matter for people who already have the game…no i feel ripped. Will the August 18 announcement be in the Sony Gamescom conference? And nothing for the people that bought it on Day 1. So in short, it’s better to wait a year before buying any game. Maybe I’ll do that with Mod Nation Racers and get all the stuff Day 1 ppl PAID for, for free. I think they should dole out some stuff to the ppl that have been playing it since Day 1… Instead the ppl that waited got it… I’ll remember that. Ohh yeah i dont have any money to buy this day one so how long will the modnation racer voucher be in there? Quick question, let’s say I already bought the first version of LBP, and got through some of it. If I decided to trade that in and get this for the bonus content (and that sweet ModNation beta access) would I still be able to use my old save files? Maybe I’ll give it a chance this time around. I was really hoping they’ll add a lot of the past DLC packs. A question though. Will these new levels designed for the GOTY edition be included in a separate section in the game itself for easy access? And if so, is this something we can look forward to for those that bought the game pre-GOTY edition? I always wondered why the level picks were never updated in the news section. Seems like this would be a great way to add these levels as well as the MM picks instead of manually searching for them. Now announce a downloadable version , just put in the tutorial and tools and sell it for $30! Will the 18 special levels bundled with this edition ever be available to people who don’t own the Game of the Year Edition? I’ve had LittleBigPlanet since day one, and I don’t want to miss out on those levels! I need to know about old save backward accessibility? Hopefully the guys that did the 18 levels for this GOTY edition got paid lol. They did some great work and helped raise the bar for community levels in LBP. This is a huge slap in the face for someone who has bought the game already. I really disagree with this business model. You’ve officially turned a MediaMolecule fan into a disappointed customer. Keep your GOTY edition. And GameStop can have my crippled edition. will the audio on this edition be updated to 24-bit lossless? Can we get that great music track that was removed back on there? It would be cool if the levels created by Dylan Cuthbert and the fellow that was interviewed on Qore got their levels onto the disc. Some more of the costumes from other Sony brands would also be nice (God of War, Ghostbustsers, etc), given that this is still $60. I’m glad I waited, but still wishing the price was a little lower. Hopefully we can look forward to more re-releases that add functionality (Resistance, LocoRoco, Lemmings, Everyday Shooter, Elefunk, etc). Will I be able to use my save of the original version of LBP with the GOTY edition? Can we get the extra levels on the regular edition we already purchased? plz?